One of my goals this year is to recommit to Meal Planning. 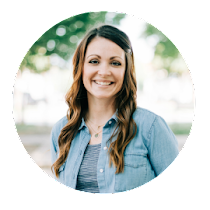 It is SO helpful to plan ahead to get meals on the table for a busy family! I used to think those who meal planned needed to get a hobby or something. 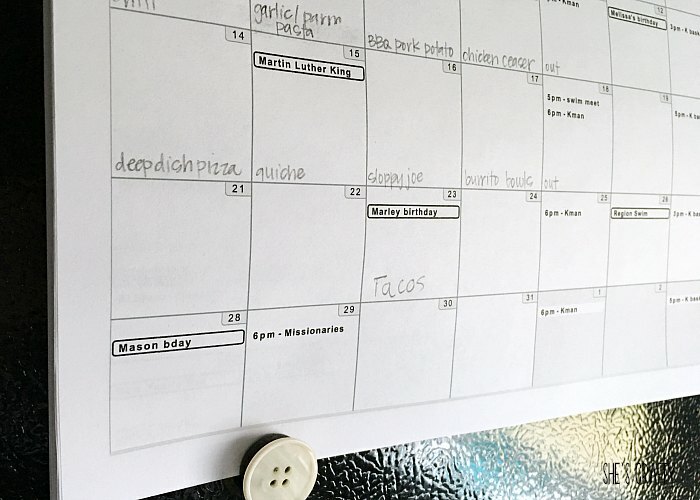 How weird is it to plan your meals? But then I tried it and let me tell you friends, IT WORKS!! As with everything else I do, I'm not perfect. I completely got out of the habit during the holidays. But I know that when I meal plan, it makes dinner SOOOO much easier and makes me feel like I have my stuff together! 7 tips and tricks on meal planning for a busy family! 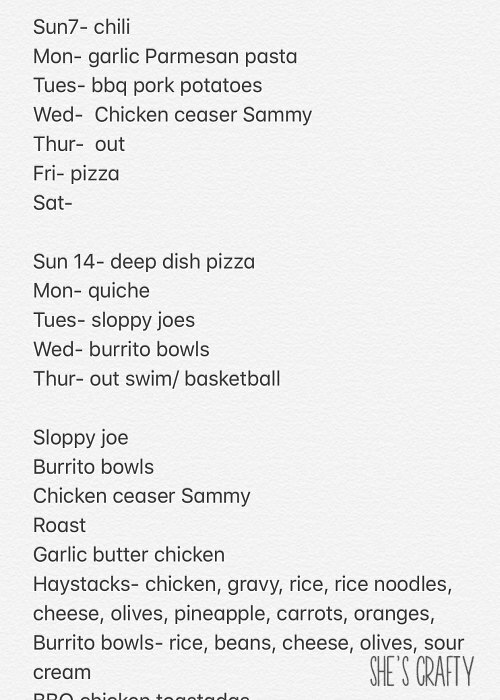 This may seem silly and obvious but I once I started writing my meal plan down, instead of keeping it in my head, it made following it so much easier. Duh! I write our meal plan in the notes in my phone, on the calendar hanging on our fridge, in my planner, seriously, everywhere. The more places it's written down, the more often you'll see it and use it. 2. Plan easy meals to always have on hand. There are always things that come up in busy families- like your husband works late and can't pick up the kids, or you had to run somewhere unexpected. If you have an easy meal idea and the ingredients on hand, you'll have a meal back up that doesn't include a drive through. On crazy nights when things aren't going as planned, I can use ingredients from my fridge and pantry and have an easy meal for my family! 3. Put those appliances in the cupboard to use! I use my crock post at least twice a week. There are tons of slow cooker recipes on Pinterest. I also use my 15 year old bread maker to make well- bread, of course. But I also use it to make dough for pizza and rolls. I pour the ingredients in and the bread maker does the rest. 4. Do a FFYS night! My family loves "Fend For Yourself". 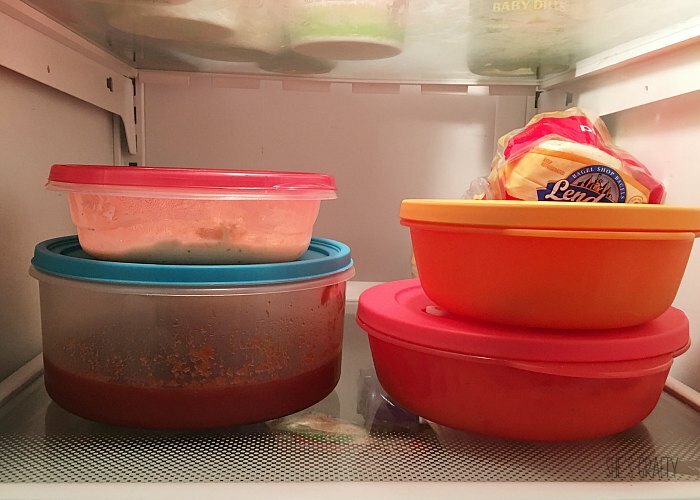 Any leftovers or frozen things they find in the fridge or freezer is fair game to make for themselves. I love FFYS nights too! Mama gets a planned night off from cooking. and a little one that plays rec sports as well. We are often on the go! I don't want to have an evening of sports practices and swim meets on a night with a complicated meal. 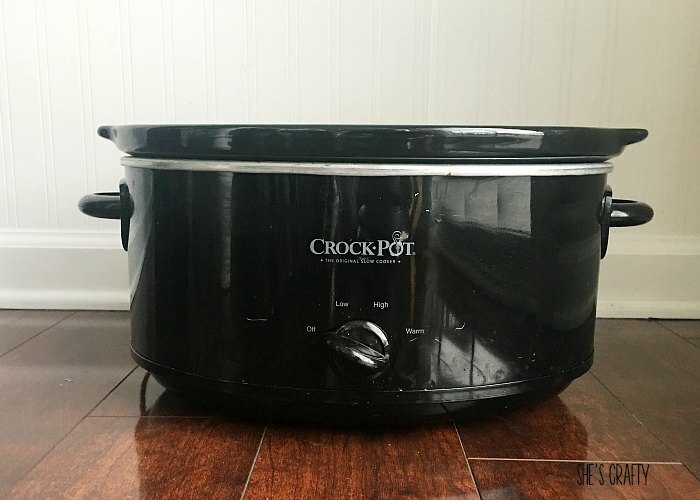 Those busy nights are a perfect night to do a crock pot meal! Keep your eyes open for recipes you would like to try. This keeps you from eating the same things over and over again! Pinterest has a million fantastic recipe ideas. You could also ask your friends and family for the recipes of their favorite meals. Or dust off the cookbooks in your cupboard. My faves are the church cookbooks- they have tried and true recipes with simple ingredients. 7. Don't be too strict. We do go out for dinner a few times a week. But rather than grab something on the run, we plan our eating as a family activity. It's great to look forward to a nice meal that you don't have to cook! 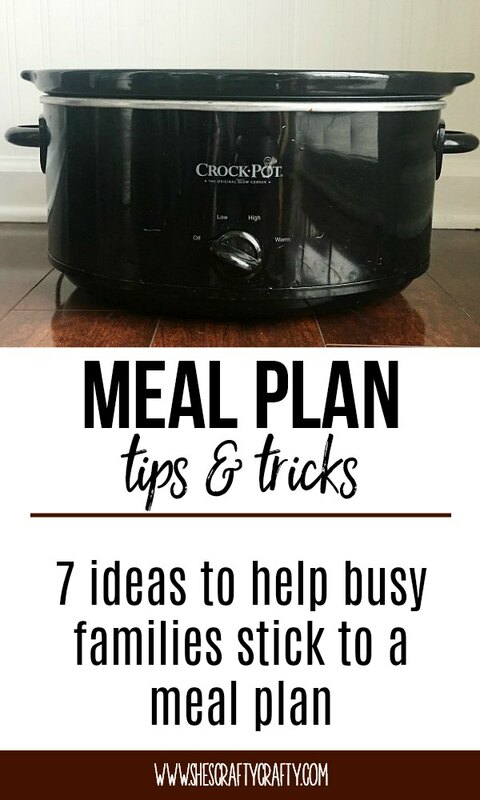 These 7 Ideas to help busy families stick to a meal plan really work for this busy family! Hopefully they will help your family as well!